Dr. Ash and the Modesto Eye Center is committed to providing the best medical care for each Merced, Turlock, Stockton and Modesto cataract surgery patient. They combine innovative cataract treatments and state-of-the-art technology to ensure each cataracts patient achieves optimum results. A cataract is a clouding of the lens of the eye, which can block or distort light rays from reaching a person’s retina. Cataracts may develop slowly over time and cause no pain. However, as a cataract grows, it clouds more of the eye’s lens, significantly impairing vision. The image in the left is the slit view of the same eye as the one seen above. The dense "pit" or the nucleus of the lens can be noted. Compare that to a healthy clear 15 year old patient's lens. 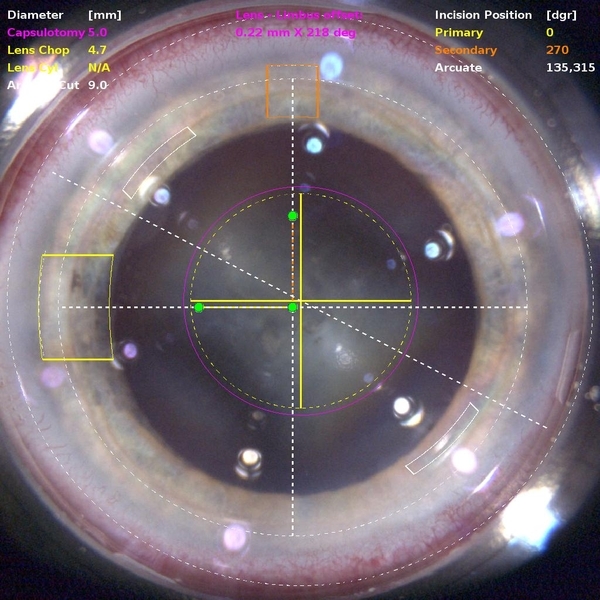 Now you can see why this patient had trouble seeing! There are several choices of implant type that can be used at the time of you cataract surgery, the standard monofocal implant, ones correcting for astigmatism, and ones that correct for near, intermediate, and far!!! Read more about these special implants on the page of Cataract Surgery & Implant Options. Cataracts can interfere with a person’s ability to live an independent life. Fortunately, the surgeons of Northern California Laser Center are considered to be Modesto and Turlock cataract surgery specialists. They use advanced, state-of-the-art technologies to treat Merced, Turlock, Modesto, and Stockton cataracts patients. Cataract in the most basic definition is the clouding of the natural lens inside one's eye. We have prepared a great segment on this topic for you. Please follow the following links some of the latest information. LASER Cataract Surgery - Learn more about Dr. Ash using the LenSx laser and bringing this revolutionary new treatment for Cataracts to Modesto, CA. If you suffer from cataracts, please call us today to set up a Consultation! The cataracts specialists of Modesto Eye Center are also Modesto LASIK specialists. They use cutting-edge technology and offer superior patient-focused care to ensure quality results for their Modesto and Stockton LASIK patients. The physicians of Modesto Eye Center and the Northern California Laser Center are renowned Stockton and Modesto lasik eye surgeons. They are also considered Stockton and Modesto cataract surgery specialists. These physicians treat LASIK Stockton and cataracts patients from their Modesto offices.